In Canada, snowmobiling has the highest rate of serious injury among popular winter sports. We see many clients who have suffered life altering injuries while riding a snowmobile. In our latest blog post we’re going to talk about the do’s and don’t’s of snowmobile safety. In 1922, a mechanically inclined 14 year old boy who was tired of walking for hours in the snow created the first snowmobile. Joseph-Armand Bombardier (name sound familiar?) simply strapped a model T engine to a makeshift sled and a Canadian pastime was born. Fast forward a hundred years and snowmobile safety has become really important. Today’s snowmobiles weigh over 600 pounds and can travel at speeds over 120km/h. Travelling on snow and ice means they cannot stop quickly. The modern snowmobile’s speed and size makes it a potentially dangerous machine. Of course, snowmobiling is fun. And despite being a dangerous sport, it can be relatively safe if you are responsible and avoid the risk factors discussed below. 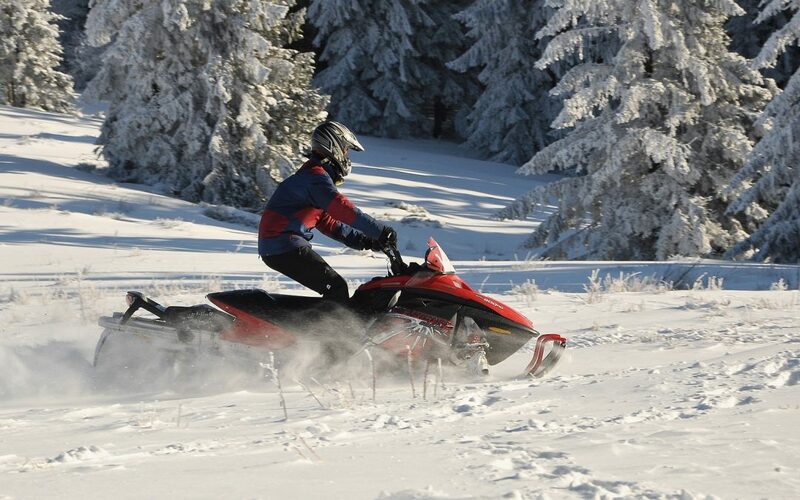 Most snowmobile injuries are caused by a few avoidable risk factors. Avoiding the risk factors listed below will greatly reduce a snowmobiler’s chance of injury. No surprise here. Alcohol does not mix with motors of any kind. Over 70% of injured Canadian snowmobilers have a blood alcohol content over the legal limit of .08. A study conducted over ten years found that excessive speed was a factor in over half of crashes causing injury in Manitoba. A major reason why speed is so dangerous on snowmobiles is their long stopping distance. Studies have found that at 72 km/h a snowmobile could need up to 272 feet to stop. The Ontario Provincial Police have stated that 41% of snowmobile deaths occur on lakes or rivers which appear to be frozen. Often ice that appears solid collapses under the weight of a 600 pound snowmobile and its rider. The safest strategy is to simply avoid riding on ice. If you must drive on ice wear a buoyant snowmobile suit. Also drive on ice that is hard and clear, not slushy, weak, or near moving water. Avoid driving on unfamiliar frozen lakes and rivers as open water may not be visible. Also, make sure to check ice conditions with the local snowmobile club before you head out. A study in Manitoba found that over two third of snowmobile crashes happened at night. Speed combined with night riding is particularly dangerous. One reason why is riders often “overdrive” their headlights. This means that once a rider increases her speed over 50km/h she will not be able to stop in the distance that her headlights illuminate. Even with a perfect reaction time, a crash is unavoidable if there is something in the snowmobile’s path. Avoid snowmobiling at night. If you are going to snowmobile at night, travel slowly. When people think of avalanche deaths they usually think of skiers and snowboarders. However, the US Safe Riders program states that snowmobilers are at the top of the list. The reason is that a group of snowmobilers can easily trigger an avalanche on their own. In fact, in over 90% of snowmobile avalanche deaths either the victim or someone riding with the victim caused the avalanche. The safest way to avoid causing an avalanche on a snowmobile is to simply not ride on steep slopes. Riding on even a 25 degree slope can cause an avalanche. If you are determined to travel up or down steep slopes, here are a few tips to reduce the chance of an avalanche. If you are travelling in a group, only one snowmobile should travel on the slope at a time. The remainder of the group should watch from a safe location until the rider has completed his or her trek on the slope. This way there is less weight on any particular area of the slope. Never park in single file at the bottom of a steep slope. Park to the side of the slope with your snowmobiles side by side and pointed away from the slope. Never ride up a steep slope to help someone who is stuck. The second sled on the slope could trigger an avalanche. Smaller sized groups are better. Now you know what to avoid when snowmobiling. Hopefully, most of those risks were obvious. Let’s talk about how you can plan to handle unexpected emergencies. Before you go out, ensure you’re prepared. It’s important to be ready for the conditions you will be riding in. Check the weather forecast before you leave. After checking the weather forecast, call a local snowmobile club or look up the status of trails online to determine their condition. Once you know the weather and trail conditions are suitable for riding you can equip yourself for the ride. Dress appropriately for the weather. It’s essential to have enough layers to be able to last in the cold should something unexpected happen to you or your snowmobile. Ensure your gas tank is full. Wear a proper helmet. Tell someone the route you are going to take and what time you expect to return. Do not snowmobile alone. Hopefully with these tips and a healthy dose of common sense you can snowmobile safely. Stewart RL, Black G. (2004). Snowmobile trauma: 10 years experience in Manitoba’s tertiary trauma centre. Can J Surg, 47(2), 90‐4. Pierz JJ (2003) 4. JJ. 2003). Snowmobiling injuries in North America. Clinical Orthopaedics and Related Research, 409, 29‐36.